Is there a set of seven points in the plane such that, among any three of these points, there are two, $P, R$, which are distance $1$ apart? Yes. Normally I like to give some more motivation for an answer, but in this case it's probably hard to say anything suggestive that the illustration below does not, besides perhaps that after experimenting one might guess that the four-point "diamond" configurations are helpful (and probably necessary) in constructing such an arrangement. Edit I've posed a follow-up question, asking whether this is the unique configuration up to Euclidean motions. Servaes wrote an excellent, detailed answer showing that it is. Among any four points there must be two of distance $\ne 1$. Every point hast at least three points at distance $=1$. For any two points $A,B$ with $d(A,B)\ne 1$ there exists $C$ with $d(A,C)=d(B,C)=1$. Not the answer you're looking for? Browse other questions tagged geometry euclidean-geometry plane-geometry or ask your own question. 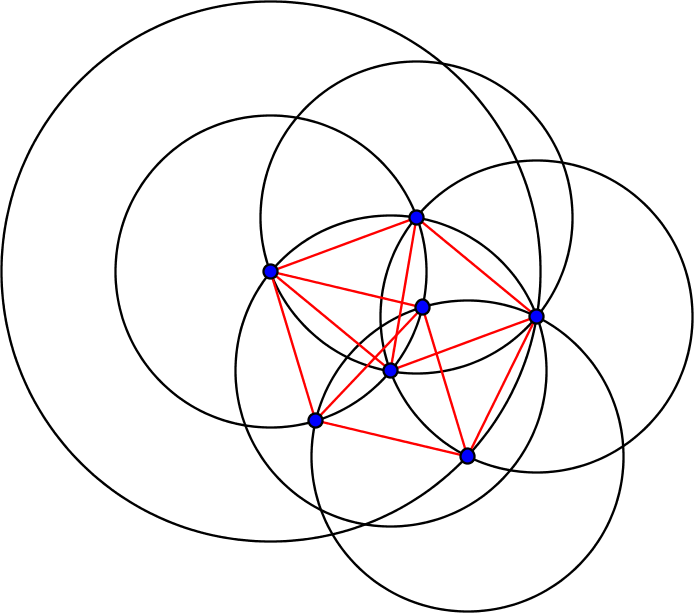 Configurations of eleven (or more) points in the Euclidean plane, such that out of any four there is a pair at unit distance. How many points among them should we take to ensure that some two of them are less than the distance $1/5$ apart? How many points are possible in the plane that are the same distance from all three points. A 70 foot pole stands pulled and anchored to three equally spaced points in the plane. How many feet apart are any two of those anchor points?